All snakes are dangerous to a degree. They have constricted, bitten, and envenomed their way into the history books as nasty creatures. Snakes have been depicted as devils, tyrants, and even Satan himself. They get a bad rap, but snakes aren’t all that bad when they aren’t trying to kill you. Corn snakes and garden snakes take care of pests, like mice, that can spread diseases. If you happen to step on one of those snakes, and they strike you, it probably won’t be that bad. A cottonmouth takes care of pests too, but is not one you want to step on since its venom is potent enough to kill you. Whether you are bugging out off-grid or gardening in your back yard; you have a chance of creeping up on a snake. Knowing the difference between a venomous and non-venomous snake is helpful in survival situations and everyday life. If you are close enough to see their eyes, you might be a bad situation. This is still recommended as one of the easiest ways to identify a venomous snake though. Slanted eyes are a surefire sign that a snake is venomous- and only one venomous snake in the US doesn’t have slanted eyes: the coral snake. The other best way to know whether or not a snake is venomous is to simply learn all of the venomous snakes. 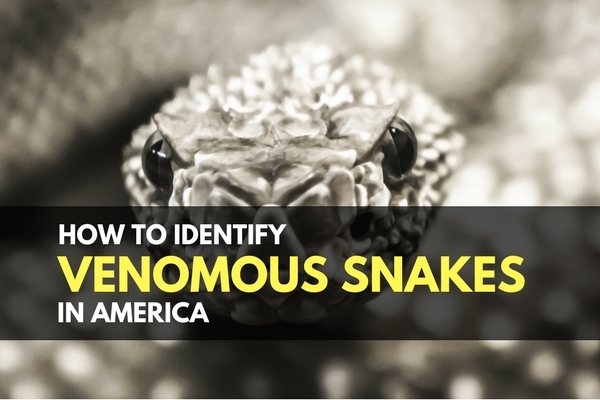 There are only four major types of venomous snakes found in America, and they can be easy to spot if you know what you are looking for. Coral snakes are relatives of sea snakes, mambas, and cobras. They grow to an adult size of around three feet long, and are slender. Coral snakes live in the southern part of the United States and there are a few variations that exist in Texas and Arizona. They have the most potent venom of snakes found in the US. 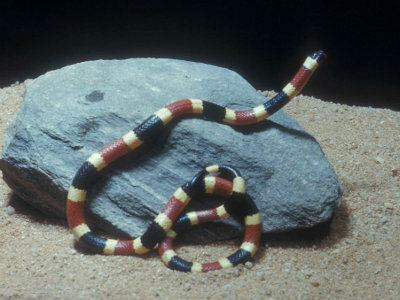 Bites are rare though, since coral snakes are not common, live in sparsely populated areas, and are very reclusive. Coral snakes are the only venomous snakes in America that are not a pit viper. Unlike the vipers, they do not have sensory pits that detect thermal radiation. Another weird fact about coral snakes is that they are the only venomous snake in America that lays eggs; the rest give live birth to litters. Rattlesnakes come in many sizes and coloration patterns. With 36 species, rattlesnakes are among the most varied of snakes found in the US and can be found all over the country. Rattlesnakes are easy to spot if you can see their rattle attached to the tip of their tail. Most extend their rattle out from their bodies when coiled so you can spot them even if they are small. You may hear a rattlesnake before you see one, due to the distinctive rattling sound they make with their tail. If you are bit by a venomous snake in America, it is most likely to be a rattlesnake bite just due to how many of them there are. They are not particularly aggressive, but still cause the most snake bite injuries. The good news is that rattle snake bites, although venomous, are rarely fatal. Copperheads can be confused with rat snakes and corn snakes due to their coloring, but have a distinctive pattern and head shape. Adult copperheads are typically between two and three feet long. They have a tan or pinkish tan coloring and dark brown bands that run the length of their body. Copperheads are found in the eastern US and prefer rocky ledges and wooded areas. I grew up with copperheads around my area, and noticed they really enjoy rock retaining walls. 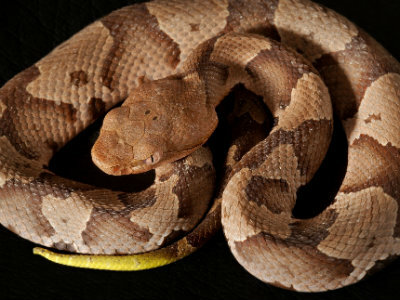 Copperheads are not aggressive, but are ambush snakes. Their camouflage is extremely effective, so it is pretty easy to step on one accidentally, which will usually lead to a bite. Overturning rocks while gardening or landscaping may cause one to strike when it is uncovered. Cottonmouths are one of the larger varieties of venomous snakes found in America, and are the only venomous water snake. They are adept swimmers, and can even swim in the ocean and are found on coastal islands. They are only found in the southeastern US and are also called water moccasins. Adult snakes are usually over three feet long and have a wider body than a copperhead. They are usually black with dark cross bands, but can still be confused with copperheads. The white band in their mouth is where they get the name ‘cottonmouth’ from and they love to open their mouth to display the white if they feel threatened. Cottonmouths can be aggressive when provoked. Being very darkly colored, they blend into many areas and can be hard to spot in the water. They will stand their ground against intruders rather than avoiding confrontation. 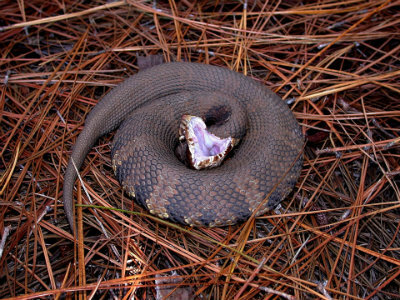 The venom of a cottonmouth is more potent than that of a copperhead, and has a toxin that kills tissue. This can leave nasty scars and possibly even require amputation if not treated. The bites are rarely fatal, however. Bites are reported most commonly around the Mississippi and Gulf area. Antivenom is always preferred when dealing with venomous snake bites. Whether or not you can get a hold of some is another story. While many hospitals and urgent care centers keep certain antivenom, others are not stocked. Coral snake antivenom is prohibitively expensive to make, and Pfizer no longer makes Coralmyn antivenom. 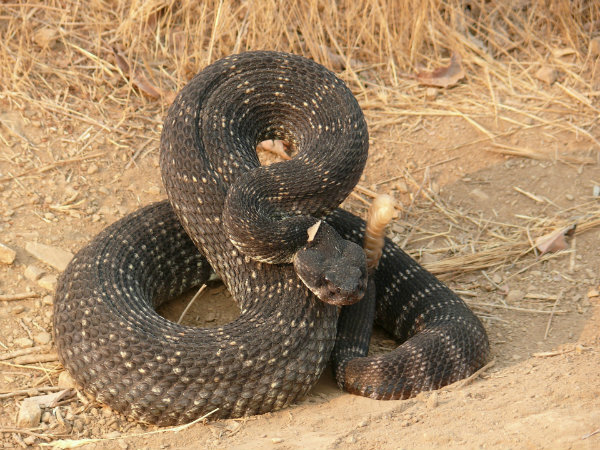 CroFab antivenom can treat cottonmouth bites, diamondback rattlesnake bites, and the Mojave rattlesnake bite. Various snakes at different sizes and ages can inject venom at varying amounts and potencies. This means you may experience different symptoms if the same type of snake bites you under different circumstances. Your own size and body composition can also affect your symptoms. Rattlesnake venom can cause blisters at the bite area, whereas most of the other snakes do not show additional signs beyond the puncture wound other than rapid onset bruising. An extractor kit is a great addition to a first aid kit. One way to lessen the impact of a venomous snake bite is with a venom extraction kit. The kits usually only work well if the bite is not in a muscular area where the venom can enter the blood stream quickly. Even then, pump extractors are not a substitute for expert medical help. The Sawyer extractor pump kit works well for snakes and other biting critters and stings, and is worth adding to your first aid kit. If you are unsure whether the snake was venomous or not, it is always best to get checked out by a medical professional than risking losing a limb or your life. We mentioned before that snake bites can obviously become infected if not cared for carefully. If they become infected, you will need to do a round of antibiotics like penicillin. Snakes can also host diseases. Tapeworm, snake mites, and salmonella can all be passed on by a bite. If you are bit by any animal you should get help from a medical professional if possible. Venomous snakes may not quite be the devil incarnate, but they can still be pretty nasty creatures. If you learn about them and respect them you are less likely to have an incident with one. A seasoned outdoorsman is less likely to get bit than someone thrashing around in their flower beds with a garden rake. You can stay a little more prepared with an extractor kit, but knowledge and being able to identify snakes is more useful than stuff. Keep exploring, stay prepared, and be safe.